This classic spinach salad is made with the traditional bacon dressing. The warm dressing is made with bacon drippings, vinegar, and sugar. The heat of the dressing wilts the spinach leaves and gives the spinach salad a wonderfully delicate sweet and sour flavor. The salad is garnished with sliced hard cooked eggs and crumbled bacon. It gets some extra crunch from the red onion and radishes. It's a simple salad with big flavor. See the variations for some add-in suggestions and ideas. Make this salad as a lunch dish or take it along to a potluck or tailgating event. Place prepared spinach in a large bowl. Add onions and radishes. Refrigerate the salad, tightly covered. Fry or microwave bacon until crisp; remove to paper towel and set aside. In a small jar or measuring cup combine the bacon drippings with sugar, vinegar, water, salt, and pepper. Refrigerate all ingredients until just before serving. When ready to serve, microwave the dressing on HIGH for 30 to 45 seconds, or until mixture boils. Toss the chopped egg with the greens then pour the hot dressing over greens mixture; toss again lightly. 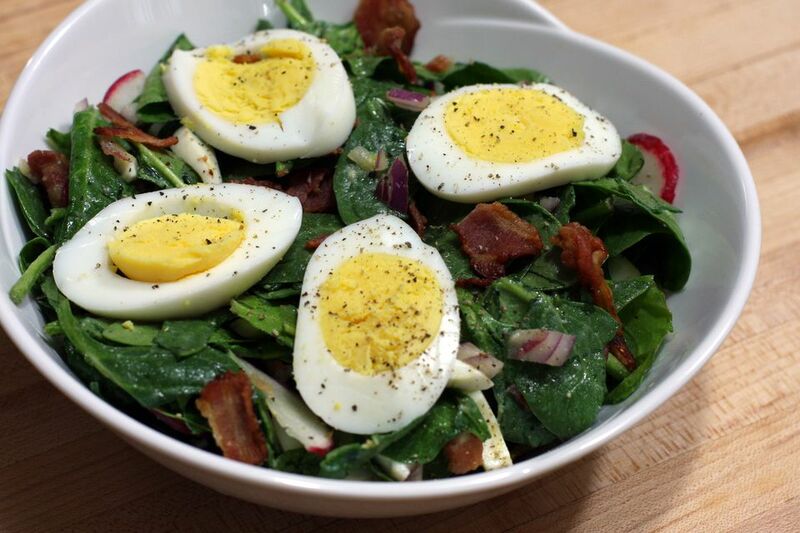 Arrange the salad on salad plates and top each with a few slices of egg and crumbled bacon. *In a saucepan, cover 2 large eggs with water. Place the pan over medium-high heat and bring to a full rolling boil. Cover the saucepan and remove the pan from the heat. Let stand for 12 to 15 minutes. Run cold water over the eggs and peel them. Make Ahead: Prepare the spinach, onion, and radishes in a serving bowl; cover and refrigerate. Prepare the eggs and bacon and refrigerate them in separate containers. Prepare the dressing and refrigerate. Just before serving time, toss the chopped egg with the spinach salad mixture. Heat the dressing; drizzle over the salad and toss. Garnish with the sliced eggs and bacon. Add about 1/4 cup of pine nuts, sunflower seeds, toasted slivered almonds, or toasted pecans to the salad for additional crunch. Add about 1/4 cup of raisins or dried cranberries to the salad. Add sliced fresh mushrooms to the salad.